In late April/early May, parts of Missouri received up to 8 inches of rain. Communities throughout the region faced flash floods and washed out roads, resulting in hundreds of water rescues and many evacuations. The town of Seneca, MO – 18 miles outside Joplin – was among the communities impacted. Comprised mostly of low-income and under/uninsured households, historic flooding and multiple water rescues occurred over the weekend as the Lost Creek spilled out into the community of 2,300 – damaging homes, businesses, and infrastructure including water, sewer, and communications access. On May 1, NECHAMA moved into the area to begin on-the-ground assessments and determine the extent of the damage as well as options for NECHAMA to engage in response work. We quickly saw the extensive need in the community and local officials requested we remain to begin to assist survivors. 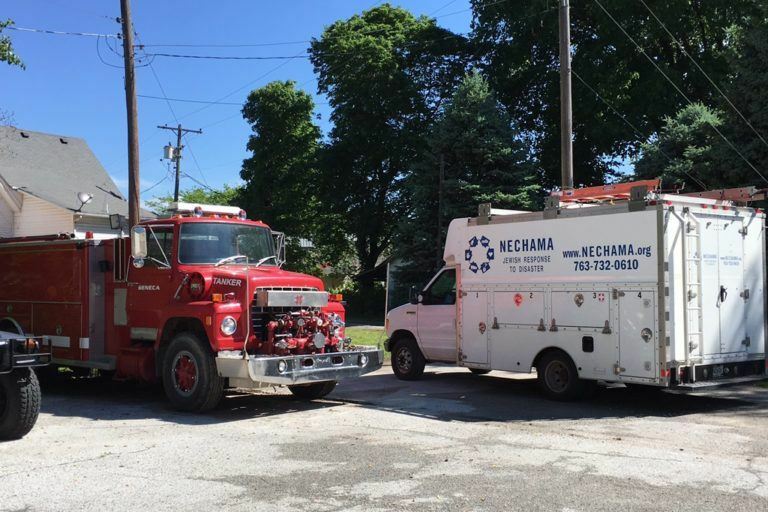 NECHAMA was joined by volunteers from across the country as well as two AmeriCorps NCCC teams to muck and gut homes in both Seneca and Greater Newton County.